But no, I don’t think I can be witty, or smart, or whatever it takes to blog like the rest of them. And I’m not Isak Dinesen. I knit, though. I work, too. I laugh, though not as much lately (better work on that). I’m about to reach the end of the Shoalwater shawl. I cast on on my birthday, so I’ve been working on it for almost two months — pretty steadily, with a few breaks, but it has given me so much pleasure that I’m almost sad to be finishing it. I’ve knitted myself and all my wishes and joys and sorrows into every stitch. And this shawl will be a place to go when I need to wrap myself in strength, for these past months have both given and taken all I’ve had. Two more rows, then the picot cast-off and i-cord edging, just as the pattern says. Then I’ll block it, and we’ll see what my fiercely-knitting fingers have managed to create. We MUST get together to work on the laughter part!!! 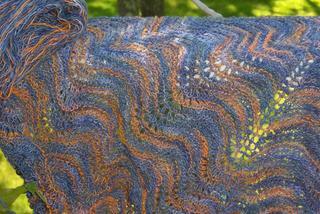 and oooohhhh that shawl is beyond beautiful!! and you are so that clever!! !